With a tradition of hospitality dating back more than 700 years, we warmly welcome you to The Shaven Crown. This medieval hostelry, one of the oldest inns in the country, is set opposite the church and village green in the heart of the picturesque Cotswold village of Shipton under Wychwood. The inn is full of charm and character with open fires, real ales and home-made food. The Shaven Crown is perfectly located for exploring the Cotswolds, with Blenheim Palace and the historic towns of Burford, Witney, Cheltenham and Oxford nearby. Click here for things to do in the Cotswolds. The Shaven Crown was founded in the 14th century by the monks of Bruern Abbey to house pilgrims and as a hospice for the poor and needy. Following the dissolution of the monasteries in the 16th century the Crown seized the hotel and Queen Elizabeth I later used it as a royal hunting lodge. Subsequently it was given to the village on condition that it became an inn with the proceeds being used to help the poor. Early in the 20th century the inn passed into private ownership and was named the Shaven Crown in homage to its founders. Through the centuries it has maintained its charm, and many original features remain, including the 14th century gateway and the double-braced roof structure of the iconic Great Hall. The Shaven Crown has seven en-suite double or twin bedrooms overlooking the medieval courtyard and village green. 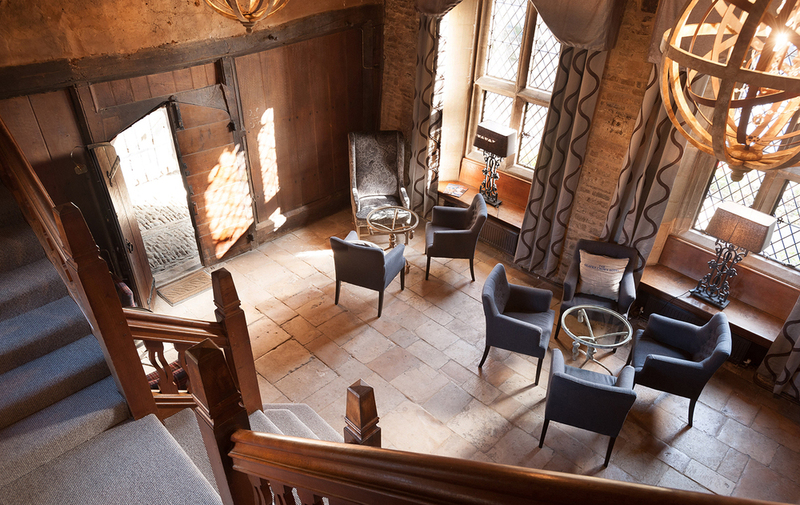 Each room is unique, but all abound with charm and character, especially the Old Chapel Room which boasts a four-poster bed and vaulted ceiling. We have a large room which is situated on the ground floor with suitable access for those who wish to avoid too many steps (this can also be used as a family room). Additional beds and travel cots are available on request. Well-behaved dogs are welcome in the bar. Dinner, Bed & Breakfast rates available for direct bookings only, excludes all drinks. Prices include Breakfast and VAT and are per night. Room rates may be subject to an annual increase effective from 1st April each year. For those who wish to dine in calm and tranquility we recommend our restaurant, while the courtyard provides the perfect setting for al fresco dining in the summer. Our seasonal menus are proudly British and our chef, Malcolm Owen, takes great care and delight in hunting out the best local and regional ingredients for each dish. Our bar is the ideal setting for hotel guests and locals alike to enjoy real ales, wines and a less formal menu which includes favourite dishes, lighter meals, salads, sandwiches and are available during the day and early evening. We are able to offer exclusive use of the Shaven Crown for many and varied events, including weddings and cocktail parties up to 100 guests. We have a new private room which is ideally suited for lunches, dinners and meetings for up to 10 people. Menus are available on request and we are more than happy to also offer bespoke options. Basically all day, however for those of a precise disposition, please see below. Monday to Saturday from 3pm to 4.30pm. Advanced bookings only, please allow at least 24 hours. All polished off with a nightcap or two!